Does our performance match our profession? 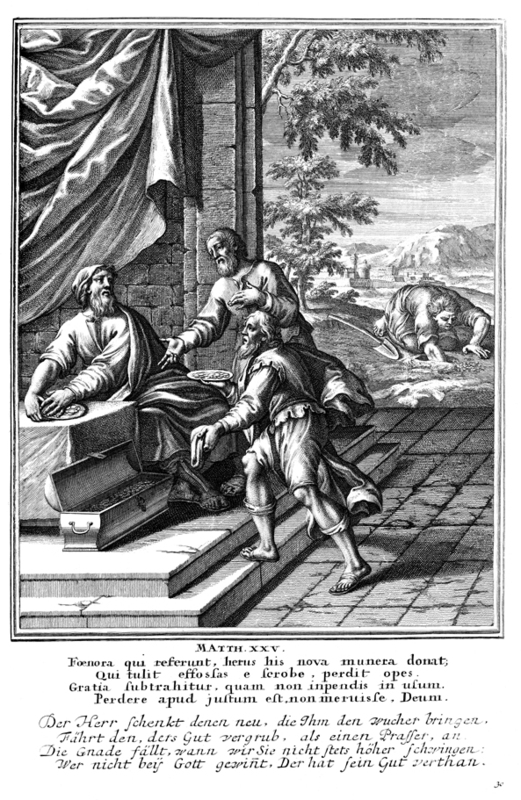 The parable of the talents, as depicted in a 1712 woodcut. The lazy servant searches for his buried talent, while the two other servants present their earnings to their master (1). The parable of the talents is well known. A contemporary outline might go like this. There were three employees at an investment firm. The owner is about to go on a summer hiatus. He gives the first employee, an “A player”, $500,000; the second, a “B” player, $200,000, and the third, a “C” player, $100,00. He asks them to steward these funds responsibly. When the owner returns in the fall, he calls the three employees into his office to report on their work. The “A” player reports back with $1 million, a 100% return on investment. The owner is very pleased. The “B” player reports back with $600,000, also a 100% return on investment. The owner is very pleased again. The third employee reports back with the same $100,000 he was given. The owner is not at all pleased. This third employee has done nothing – not even depositing the money in a savings account to earn minimal interest. The owner takes the $100,000 from this third employee, who is fired on the spot, and gives it to his “A” player. What ultimately condemned this disciple, and made him unready to meet his Lord at the parousia, was the fact that he had proved to be “useless” for the kingdom of heaven. Like the man ejected from the wedding feast in 22:13, his performance had not matched his profession (emphasis mine), and it is only those who “do the will of my Father who is in heaven” (12:50) who ultimately belong to his kingdom (2). Does my performance match my profession? I profess to be an ambassador of the kingdom of heaven, carrying the best news that anyone could ever here, that there is a God who created them, understands them, and offers them forgiveness and a new life. He commissioned me to advance this message before he ascended to heaven. He’s coming back and he’s going to ask me what I did with my commission. Will I be one who acts with “entrepreneurial boldness” (R.T. France again) or one who buries what I have in the ground? My performance does not match my profession to the extent that it should. I waste way too much time watching television. I commit to things that I shouldn’t and fail to follow through on things that I should. My performance in private and with my family needs improvement. The good news is that I have already made some good investments privately and publicly and I’m empowered by the Holy Spirit to continue in these. I’m going to enjoy making some course adjustments today and pursuing the fantastic calling given to me. How about you? When you look at your own performance, where are you doing well? Where do you need to do better? Please share your comments below. What have I done this week to fulfill the mandates of my calling? Do I even know what my calling is? If not, what commitment will I make to discern it? (2)  France, R.T. (2007-07-27). The Gospel of Matthew (New International Commentary on the New Testament) (pp. 956-957). Eerdmans Publishing Co - A. Kindle Edition. This entry was posted in Business and tagged calling, Matt. 25, parable of the talents on November 7, 2014 by Steve Godfrey.